They say to eat a rainbow, but I am trying to eat more green, as the reds and oranges come too naturally to me. I am also trying to figure out what to plant in my garden, and Swiss chard made the potential list. Truth be told, this was my first time eating Swiss chard. This got me thinking, why the heck is that? Because, I am a sucker for sales. And you know what, Swiss chard never goes on sale (neither do pea shoots, and what a treat it was to discover those!). I get side-tracked when baby spinach is less than $4/lb, or wooed when red peppers are under $1/lb, and perfectly smitten when juicy navel oranges are 33 cents/lb (yes, there will be many recipes with orange to come!). But Swiss chard had never made it to my grocery list, until now. 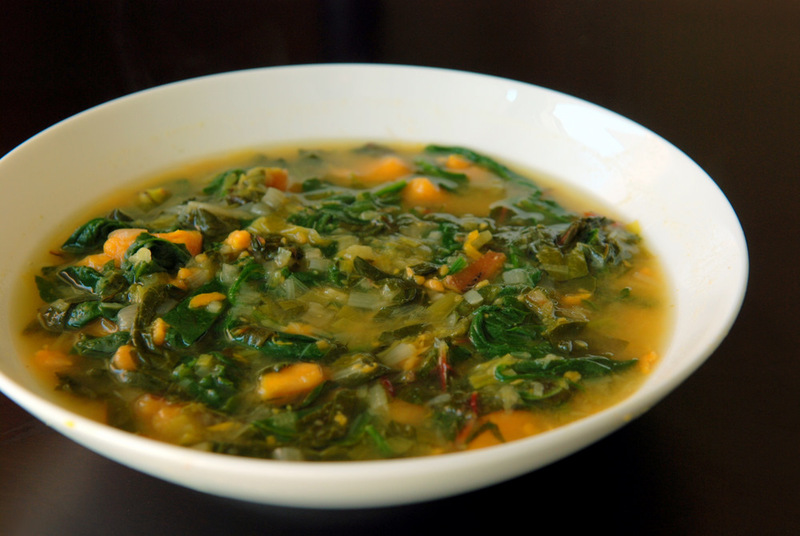 I spotted this recipe in Love Soup (Heidi had already posted the recipe here, too), and was impressed that there was nearly a pound of leafy greens in the soup! Plus, there was a sweet potato and ginger, as well, which I knew worked well from my previous Japanese Winter Stew. I preferred the soup prior to pureeing it, where I could taste each individual ingredient. 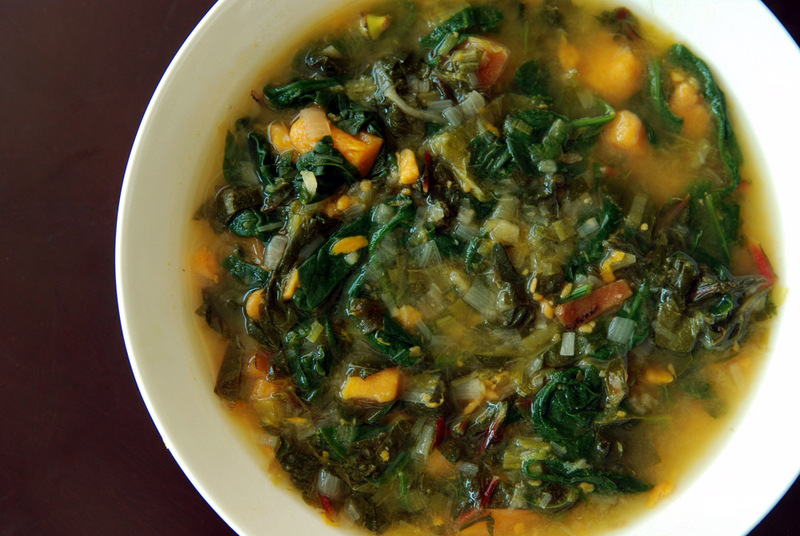 The caramelized onions lent a delicious sweetness to the soup, the ginger a bit of bite, the sweet potato proffered its creaminess, all the while dancing around the multitude of greens (feel free to substitute your favourites). You pile in so many vegetables but they wilt down nicely, as you can see. 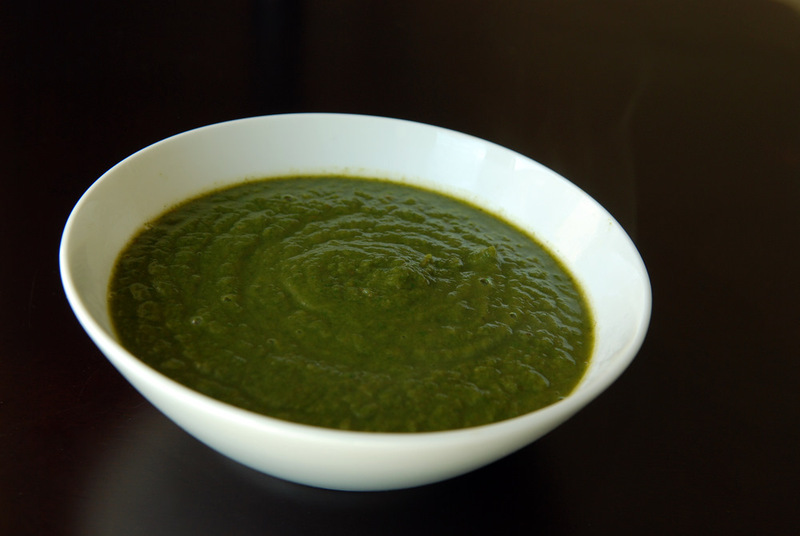 Other than using baby spinach, I followed the recipe fairly closely. This is surprisingly a quick soup to make, but I took the longer one-pot route. Anna suggests caramelizing your onions while the rest of the soup simmers, but I really wanted to deglaze the pan after caramelizing my onions, so I waited for my onions to finish and then threw the rest of the ingredients in afterwards. I am so excited about Love Soup, as all the recipes look delicious, and perfect for someone with a backyard filled with vegetables. I can’t wait to plant some Swiss chard this summer (yes, it made the cut) and explore more of Anna Thomas’ recipes. This is my submission to this week’s Potluck Party for cold remedies and Deb for this week’s Souper Sundays. A few months ago, I stumbled upon a gem of a restaurant called Rawlicious. I try not to go out to eat very often, but if I do, I try to go somewhere that is different than what I might make at home. While I may not agree with the philosophy of raw purists, I see no harm in eating more raw foods, nor in exploring the techniques that goes into raw cooking. Raw cooking – is that an oxymoron? While I have already been smitten by raw kale salads, it was at Rawlicious that I discovered spiralized zucchini noodles (oh yes, I want a spiralizer! especially if I grow zucchinis in my backyard!) and raw cheesecake (tastes more like a mousse than a cheesecake but I was impressed by the versatility of cashews!). I know that some vegans can have a hard time giving up certain meat or dairy products, and there seems to be a plethora of vegan alternatives for sale. However, talk about processed food! I can’t say I am really interested in soy yogurt or processed meat alternatives. I am still searching for a good sour cream alternative, if only to make a Hungarian Chickpea recipe I have had my eye on (anyone care to share their favourite recipe?). I have seen a few cashew cheese recipes, and was intrigued. Especially when I saw Gena’s Zesty Orange Cashew Cheese since it included fresh orange juice. You will note that I changed the name of this from cashew cheese to cashew spread, because I’ll be honest that this didn’t taste at all like cheese. But it was DELICIOUS! A sweet, creamy dip with full orange flavour with a complexity coming from the miso. There are many ways to use this addictive spread, other than eating it straight from a spoon (that is great, too!). Mix it with some salad greens, spread it onto bread or crackers, or add it to your favourite sandwich/wrap. This is being submitted to this week’s Weekend Herb Blogging, hosted by Min at Honest Vanilla, to this week’s Raw Thursdays well as to April in the Raw. Mine was great! It was a great time to connect with Rob’s family, relax and we were also able to squeeze in a short (if you consider 6 hours short for 88km, but still brutal) bike ride on Good Friday. As I mentioned earlier, I was was a bit hesitant about what I would eat over the holiday weekend while being away from home, considering I have cut out dairy, fish, meat, refined flours and sugars. In the end, there was no need to be stressed at all. Rob suggested making a few things while we were down, and I picked out some dishes that I knew tasted great, used relatively common ingredients and would appeal to a wide range of people. In the end, I made the red lentil and lemon soup for Good Friday, the black bean, cilantro and apricot salad (substituting fresh orange juice for the mango nectar which was just as good) and my staple hummus recipe from my university days: peanut butter hummus (no tahini or sesame oil needed!). They were all well received, thank goodness! The main meal over the weekend was Sunday Easter brunch, which was filled with an overabundance of Polish goodies. Nearly everything had meat or eggs, but I was able to contribute some greenery. I chose to share this salad that my family and I enjoyed over Christmas. While a raw kale salad would be different in itself, I figured the beets would bring some Polish-style comfort to the new dish. 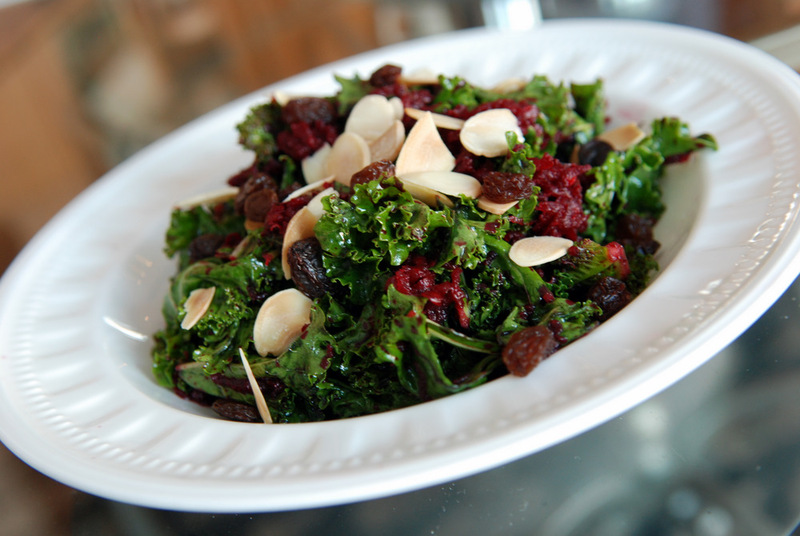 Adapted from Ainslie at Everyone is a Vegan, I really liked the mixture of the massaged/wilted kale with a sharp lemon dressing, raw grated beets with sweet dried fruit (a mixture of raisins, currants and dried cranberries works well) as well as crunchy toasted almonds. Before I made this salad, I didn’t know you could eat raw beets, but you can, and they taste great. A tip for working with beets, though: if you buy them with the greens, leave yourself a long piece of stem to hold. This way, when you grate it, your hands don’t get nearly as purple (not that that is necessarily a bad thing, but I’m just suggesting how to stay clean!). This is also a perfect salad for parties, since you can make it advance, and if you make too much, the leftovers keep well for a few days. What a super salad! Judging by how many people have invited themselves over to (not yet) our new abode, I better start compiling a list of easy, crowd-pleasing dishes like this for company. This is my submission to Deb for this week’s Souper Sundays, to this week’s Potluck Party for healthy salads, as well as to April in the Raw. I can and it tastes like this salad. It is light, fresh and filled with green vegetables bursting with flavour. It may have been snowing this week, but I felt the the need to bring spring back into my cooking. Unfortunately, my own pea shoots are still too small to harvest, so I went back to T&T to pick up some more pea shoots for an instant boost of spring. 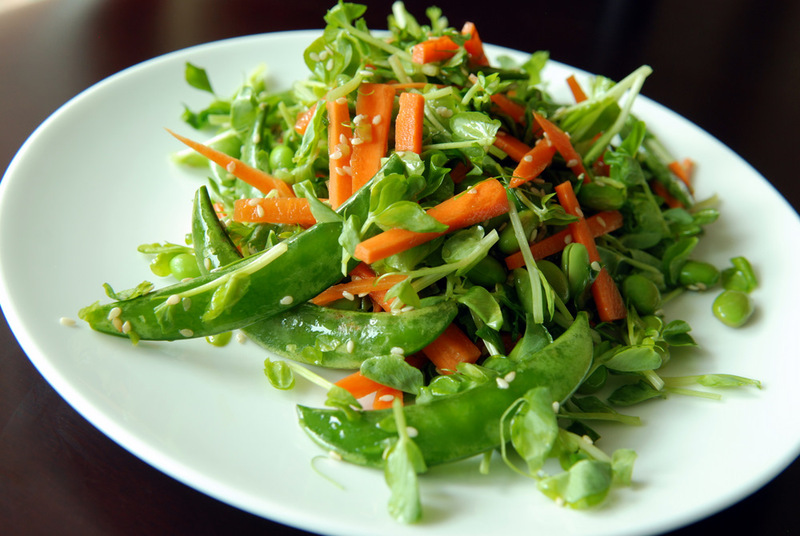 Inspired by Gourmet (June 1994), the base of this salad comes from pea shoots, which are sweet like peas with a nice body from the stems and delicate leaves. 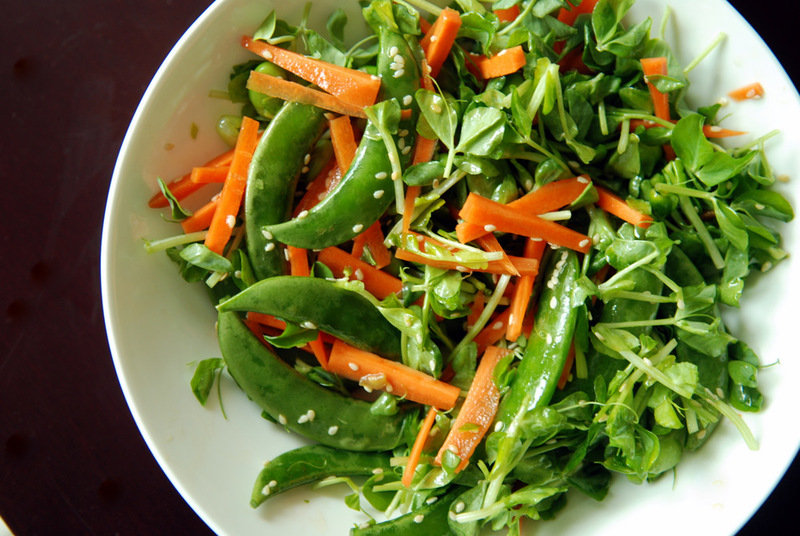 I topped it with fresh sweet sugar snap peas, edamame and carrots and coated it in a subtle sesame dressing. The star of this dish are the veggies, not the dressing. The thing I love about this salad, though, besides its mouthful of spring, is that it is a very satisfying salad. Deceivingly so, it fills you up. The edamame really helps to increase the fat and protein levels. While each serving of this salad has only 180 calories, it also boasts 11g of protein, 22g of carbohydrates (7g fiber) and 7g of fat. That is something everyone could use from a salad! This is my submission to Ivonne at Cream Puffs in Venice for this week’s Magazine Mondays, to Deb for this week’s Souper Sundays, as well as to April in the Raw (substituting some of the toasted elements, and not cooking the edamame). Since I will be moving in a few months, I am more determined to eat through the backlog of stuff in my freezer and pantry. I have a bit of frozen fruit, including frozen mango, in my freezer and I have found it hard to be inspired. Mango, so succulent and juicy is best fresh and I rarely cook or bake with it. Frozen mango deserves a special place in my kitchen, but so far I have been stumped. Until now. 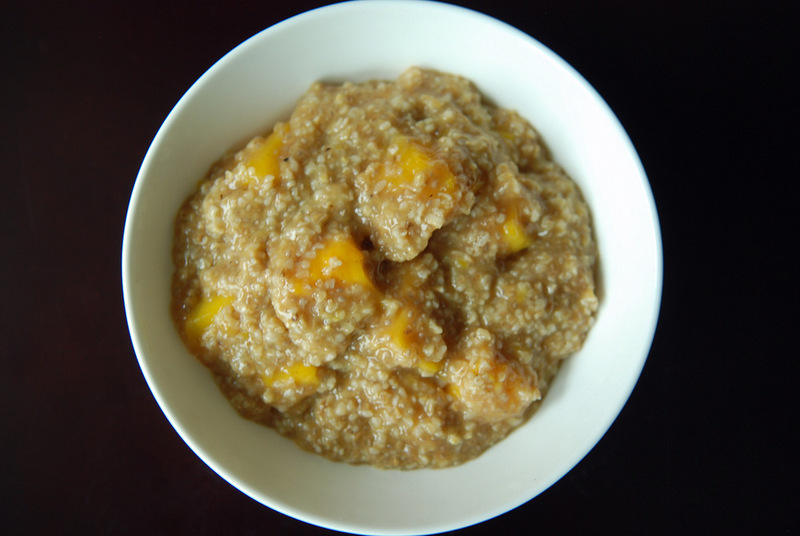 My morning oatmeal is a great place to experiment and this did not disappoint. 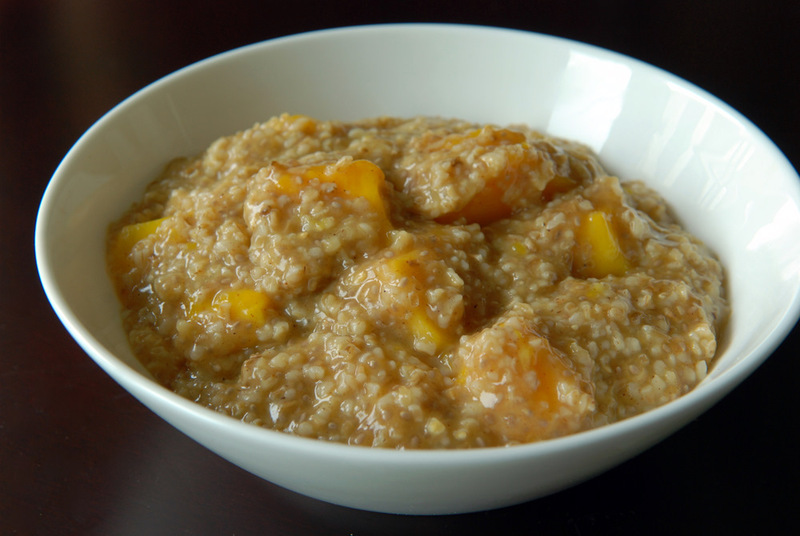 I simmered my steel-cut oats and chia seeds with a bit of leftover mango nectar as well as these juicy frozen mango pieces, spiced it with cinnamon and freshly grated nutmeg and found myself in the tropics for breakfast. It couldn’t have been easier, especially since I used the quick-cook steel cut oats from Trader Joe’s. 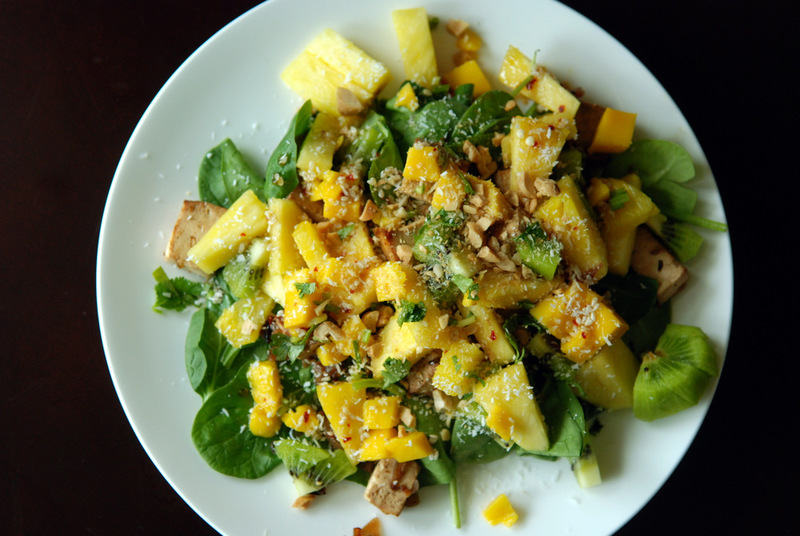 This is my submission to this month’s Veggie/Fruit a Month, featuring mango. Since declaring myself vegan (although in addition to cutting out dairy, fish and meat, I have also cut out refined sugars, flours, breads and pasta; focusing more on fruits, vegetables, whole grains and legumes), this has caused quite a hubbub amongst my friends and family when we eat together. What will I eat? Does the restaurant have a Janet-friendly vegan option? And what the heck will I eat over Easter? I didn’t really anticipate this, because my meals have gradually become vegan over time. Combined with a few new cookbooks and new (and old) blogs that I follow, the transition in my own kitchen has been easy and gone un-noticed for the most part. I just had to switch from my 1% milk to a nondairy drink (I have been meticulously documenting my experiences to find my favourite). I am hoping my blog can inspire others to try recipes that are filled with more whole foods. Contrary to popular belief, the foods I eat taste good. I make no apologies for including a lot of fresh produce and spices, because that’s where the flavour comes from. However, there are lots of recipes that I make that are very simple and fast, too. 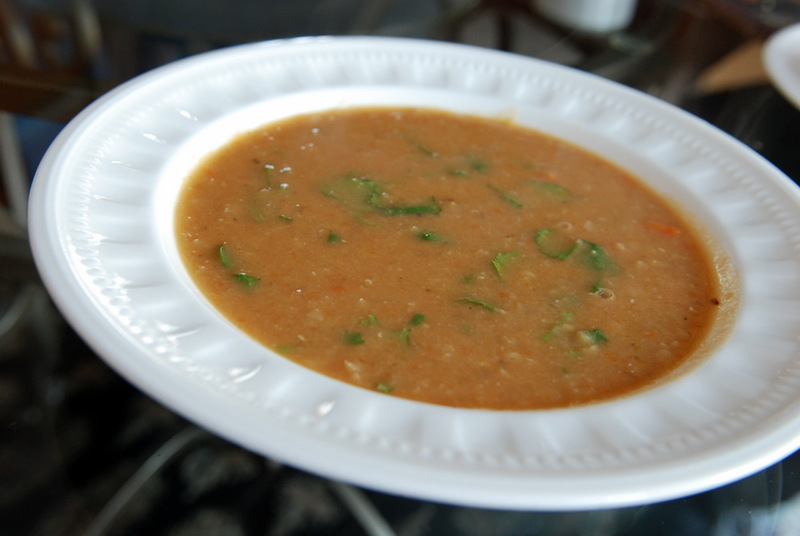 I first made this soup to rave reviews from my family over Christmas, including my Dad who doesn’t really like beans, and I plan on breaking it out again over Easter. 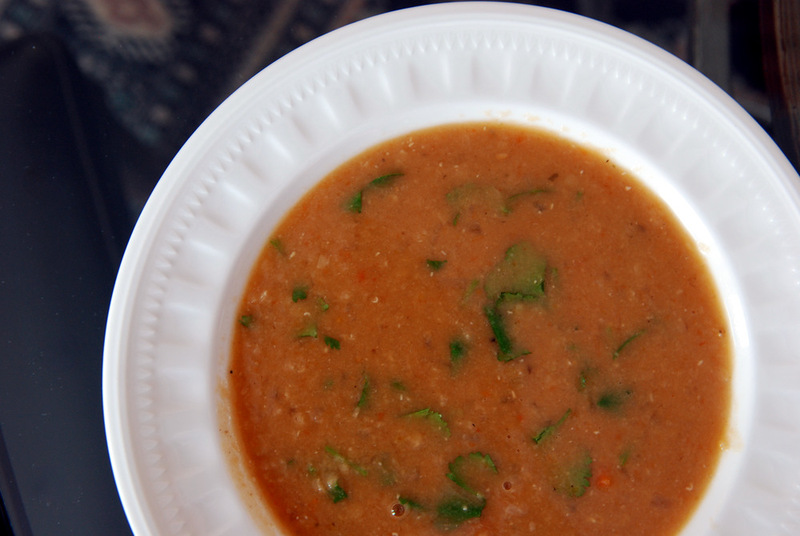 Adapted from the New York Times, red lentils are simmered into a creamy yet chunky soup, that is complemented by a smoky cumin-tomato broth yet becomes a light soup with the fresh lemon juice. 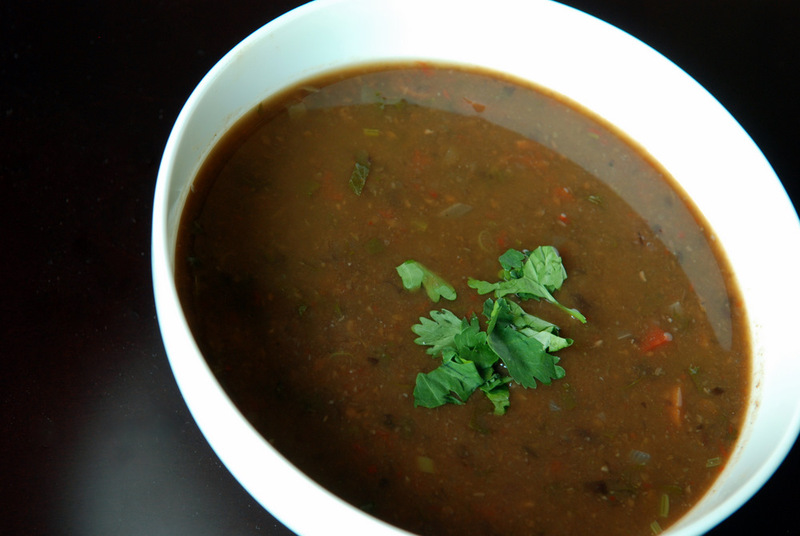 The cilantro is stirred right into the soup and adds the brightness that makes this soup so special, so please do not skip this step. Such a simple recipe, yet it is more than the sum of its parts. Decadent enough to be served to company and quick enough to prepare so that you can enjoy their company instead of labouring in the kitchen. Easy to double so you can enjoy leftovers for a few days. What vegan meals do you enjoy sharing with others that are not vegan? This is being submitted to this week’s Weekend Herb Blogging, hosted by Haalo from Cook (Almost) Anything. If last year was the year of Aleppo chili flakes, pomegranate molasses and bulgur, I already know what 2011 will be: year of the beans (and pea shoots!). Yes, I will be full (of beans) this year. Chickpeas, black beans, red kidney beans, lentils (of many colourful varieties), cranberry/Borlotti beans, lima beans, adzuki beans and edamame. If my recent trip to Kalustyan’s is any indication, I will also begin cooking with Anasazi beans, Appaloosa beans, Calypso beans, Christmas Lima beans, Jackson Wonder beans, Jumbo Lupini, Macedonian Tetovac, Rattlesnake beans, Scarlet Runner beans, Spanish Tolosana (Prince beans), Tepari beans, and my favourite (purely by name at this point) Tongues of Fire beans! 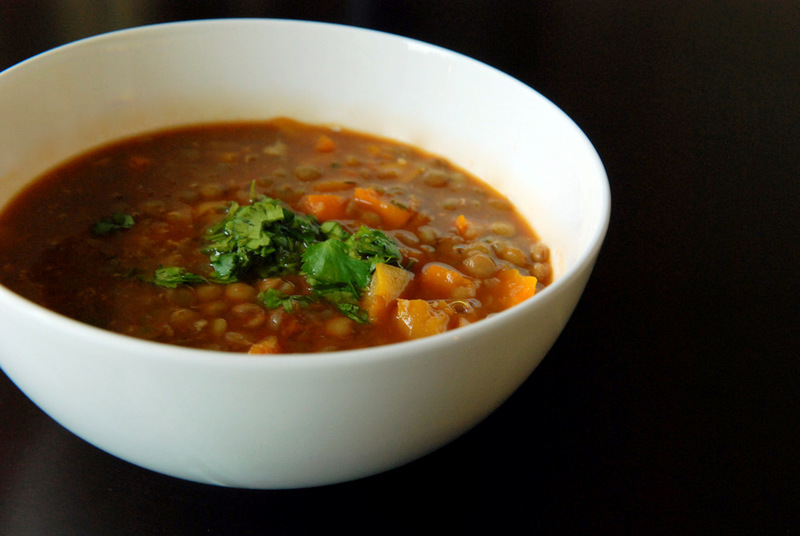 For the less bean-savvy, lentils are great because they cook up quickly. They don’t require any pre-soaking, so everything can come together once the beans are finished cooking in 20-30 minutes. This is being submitted to this week’s Weekend Herb Blogging, hosted by Anh from A Food Lover’s Journey. Who likes garlic? I mean, really likes garlic? I probably shouldn’t scare the garlic-shy from this recipe, because it was really tasty. And didn’t leave me with garlic breath, so it couldn’t have been that potent with 14 cloves of garlic. Ten of those garlic cloves are roasted, so they don’t really count towards the scary garlic count. Although, I almost had second thoughts as I dumped in 4 cloves of raw garlic at the end of making this stew. I shouldn’t have doubted Anya’s genius, though. This recipe comes from The New Spanish Table, and I had been eyeing this recipe for months (I first mentioned it on my list of things to make with butternut squash back in November and again in January!). Honestly, I waited too long. This is a lovely, hearty stew that is both savoury but still slightly sweet. 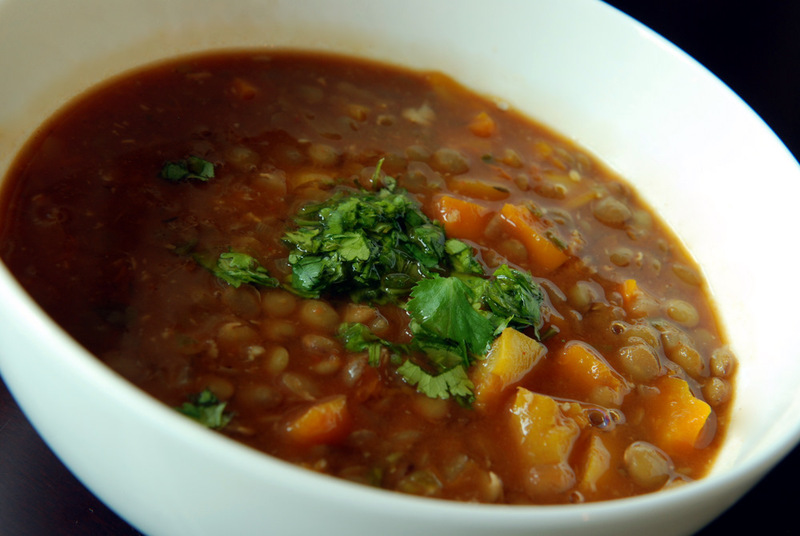 Lentils fill the stew as its base, and the butternut squash and red peppers add colour and sweetness. A head of roasted garlic brings a mellow sweetness as well. The peppers are both boiled and pan-fried for a contrast in flavour and texture (but I feel like this step could be skipped if you are pressed for time). And while I stated I don’t want to muck with Anya’s genius, I made a slight modification to her recipe, that I think lent to its prowess. Instead of adding in two fresh tomatoes (nothing with a fresh taste is around during the winter! ), I added 1 cup of passata (strained tomatoes) at the end. This is where you get a silky tomato base for the stew that complements the squash, bell pepper and lentils so well. In a few months, I will be moving from my tiny (but cozy! I love it! I will miss it. Anyone want to rent it?) apartment to a house. Not any house, though. A house with a garden: which I plan on filling with vegetables. While I had a mini container garden on my balcony last year, there will be a lot more space in the new place. Thus, the question is what should we be planting as beginner gardeners for our first garden? My first list was to pick the things I like to eat: tomatoes, sweet potatoes, butternut squash, spinach, broccoli, bok choy, cilantro, garlic, and lots of herbs. I have visions of lots of kale, swiss chard and snow peas. However, after reading a bit more, I definitely had to revisit these plans. Butternut squash need a lot of room. Broccoli and cabbage scream “eat me!” by attracting a lot of bugs. Bok choy is hard to grow. Cilantro likes to bolt when the weather gets hot. Garlic needed to be planted in the fall. Hmmpht, this is not as easy as I was hoping. In an effort to find easy plants to grow that we will want to eat, we’ve been investigating new vegetables. Eat them now to see if we want to grow them later. The first vegetable we were intrigued by was kohlrabi, one of the oddest looking vegetables (?alien baby in vegetable form). Truth be told, I had never even heard of kohlrabi until Dawn started posting a bunch of recipes as she got them through her CSA. I had not seen them in the grocery stores, either. Until I started to look, of course. Bestwin for the win, sells 4 of them for $1. Rob took a few and made a light, yet earthy Indian-Spiced Kohlrabi and Quinoa Salad and I used the last kohlrabi to make this delicious wheat berry salad, inspired by Enlightened Cooking. It has been a while since I’ve cooked up some wheat berries. Since wheat berries take an hour or so to cook, I was tempted to bring out quinoa instead for the salad. After seeing wheat berries appear in a few recent recipes, I reconsidered. It has been too long.. and I should be cleaning out my pantry, right? 😉 It was the right decision, too: wheat berries were fabulous here. Reminiscent of two of my favourite wheat berry salads, a bright citrus dressing pairs incredibly well with plump, nutty wheat berries. 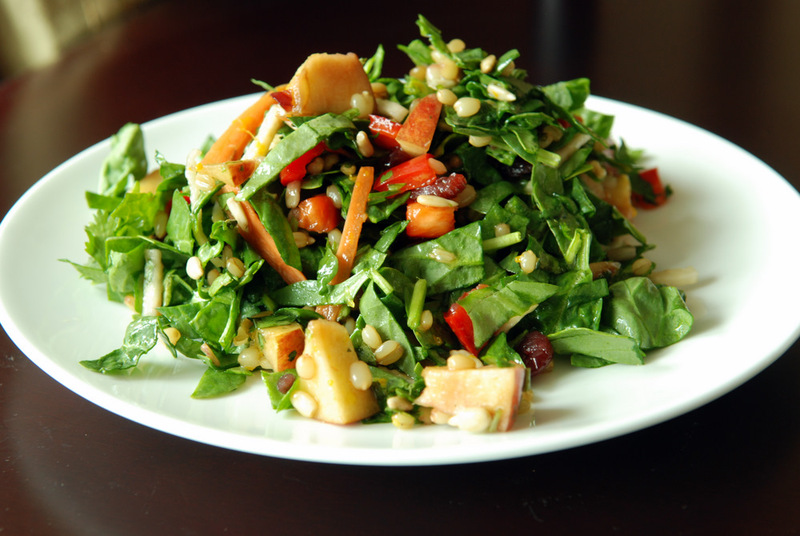 The salad is flavoured with a tart-sweet crisp apple, chopped sweet red pepper, dried cranberries as well as crunchy carrots and sunflower seeds. I added lots of cilantro and mixed in slivered baby spinach (pea shoots were great, too!) for more body. 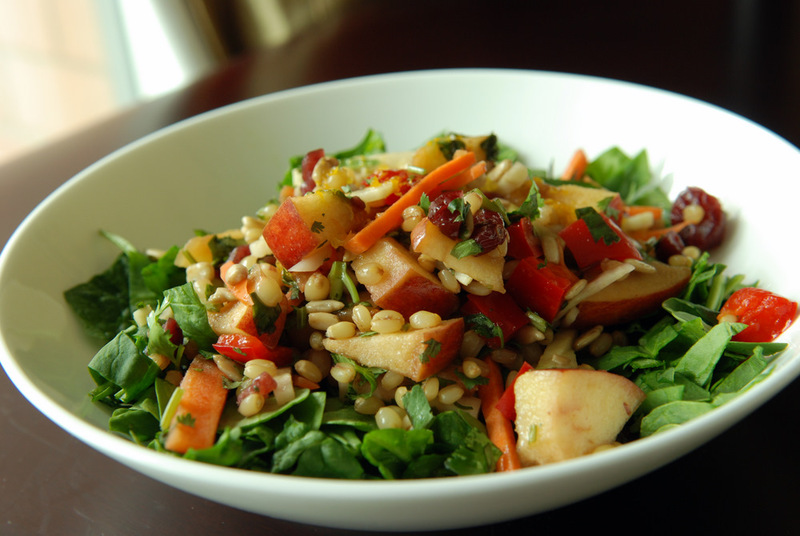 While it may seem counter-intuitive, a tip I’ve picked up for wheat berry salads is to dress it right before serving. 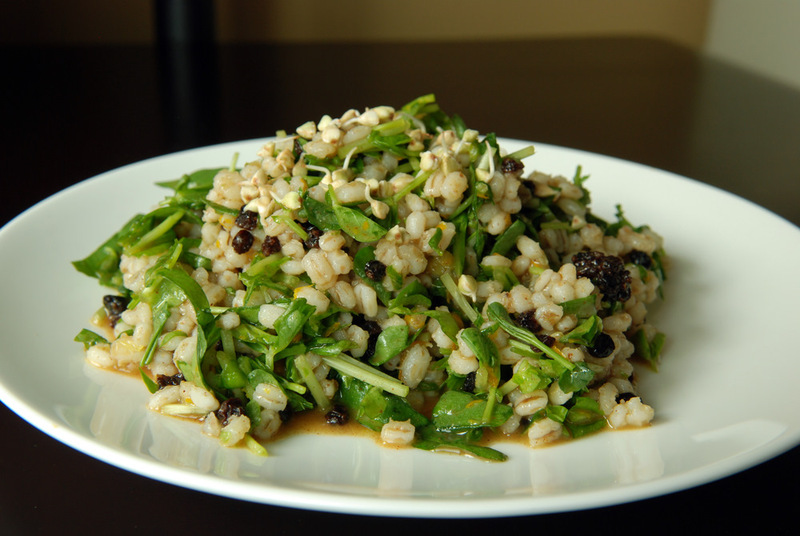 Otherwise, the wheat berries sop up the dressing and it becomes dry when eating them as leftovers. Oh yes, and the fresh kohlrabi. Hard to describe, but it tastes like broccoli and cabbage with the texture of an Asian pear in a broccoli stem form. Maybe that makes sense to some of you. The conclusion, though, is that I like it! This was a fabulous salad, kohlrabi and all. Hopefully it makes it into our new garden. This is my submission to Deb for this week’s Souper Sundays, and to this month’s Herbs and Flowers in My Platter, featuring cilantro. While travelling in Morocco, one of my favourite meals was from Al Fassia in Marrakech. Even during the low tourist season, we made reservations before we arrived in Morocco. It is deservedly that popular, and they had to continually turn people away who wandered in from the street. We shared a delicious vegetarian harira, a hearty tomato-based lentil and split chickpea soup topped with dates and lime; followed by a pigeon bastilla, where pigeon meat is cooked, topped with ground almonds and pistachios, wrapped in warka, a thin phyllo-type dough and then sprinkled with cinnamon and sugar; a slow-roasted lamb shoulder dish whose name escapes me right now, but I cannot explain the sheer volume of the entire shoulder; and somehow still (not really) had room for the traditional Moroccan Orange Salad for dessert. The Moroccan Orange Salad is prevalent around Morocco and incredibly delicious despite seemingly so simple. Personally, it is so much more than oranges and cinnamon, and if you are in Morocco and they don’t include orange blossom water, then consider it inferior, truly. 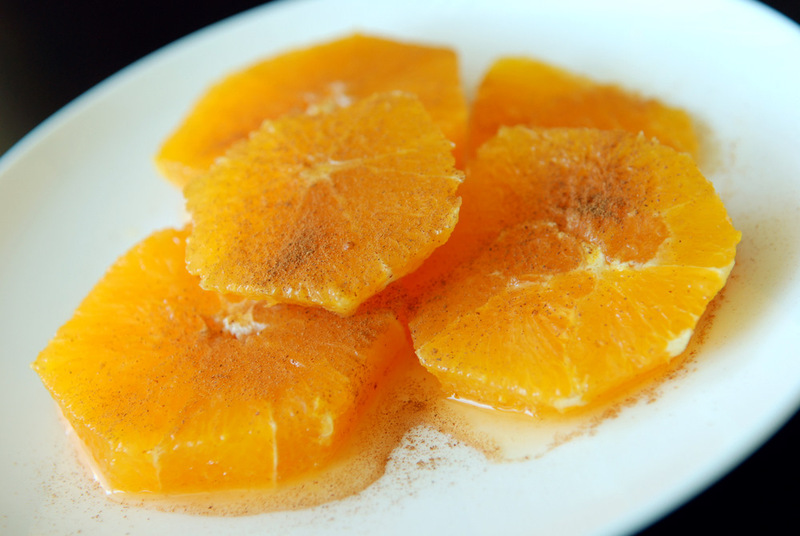 But if you are elsewhere, and don’t have it, just delve into the simplicity of oranges and cinnamon. They complement each other, with the sweetness of the orange, the sweet earthiness of the cinnamon and the addition of orange blossom water gives it that subtle edge, that curiosity if you are not familiar with it. During the cooking class, we learned how to make 3 Moroccan salads. Although salads in Morocco typically means dip and not what you might think a salad is in North America with greens. We made zaalouk, a fried eggplant dip; tomato jam (confit de tomates), a savoury tomato spread; and zucchini stuffed with tomato and cilantro. For the main dish, we were able to pick which tagine we wanted to learn (chicken with preserved lemons tagine, lamb with dates and almonds, or veal with apricots tagine). We opted for the veal tagine, and since I was so smitten with bastilla, I asked to learn how to make that instead. For dessert, we learned how to make milk bastilla, a piece of fried warka dough is topped with custard and strawberries. Our teacher was also generous with her knowledge of Moroccan food culture and even other recipes we were curious about! I had really enjoyed a traditional Moroccan cookie, coconut ghoriba (Moroccan macaroons) and this orange salad. I frantically scribbled the recipes down as she rattled the recipes off the top of her head. I was lucky to be travelling in Morocco during clementine season, but this salad can be enjoyed whenever you have juicy oranges available. I am partial to Navel oranges, but feel free to substitute your favourite. You could also add some slivers of almond, mint and/or dates for extra oomph. This is a light, sweet-savoury salad that is perfect any time of year. It would quench your thirst during the summer and bring you back to the tropics while you are combating the harshness of winter. This is being submitted to this week’s Weekend Herb Blogging, hosted by Rachel from The Crispy Cook, as well as to April in the Raw. While I adore winter soups and stews, and some of my favourite produce is abundant during the winter (butternut squash, sweet potatoes, kale), sometimes the local produce gets to me by the end of the season. One way to beat the winter blahs, is to incorporate fruit into my meals. 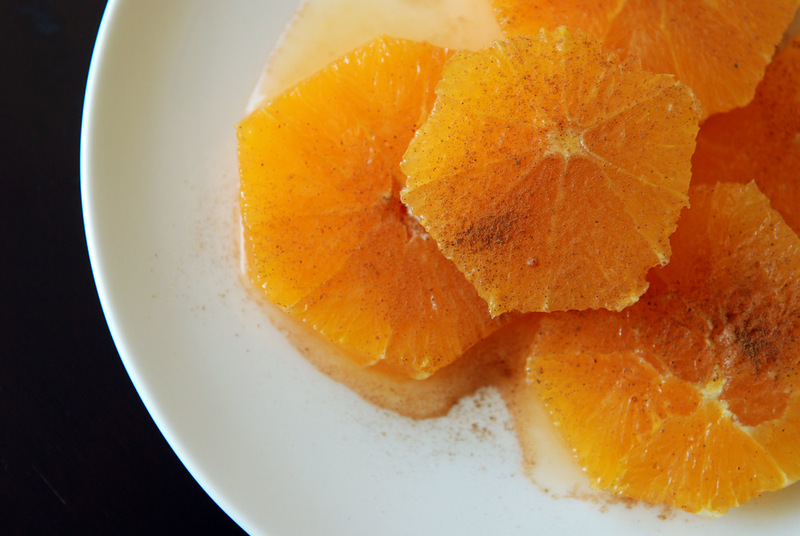 This time of the year, citrus is abundant, which is a good way to liven any dish. One of my favourite soups this winter was the Spinach, Orange, Yam Soup, due to the lightness from the fresh orange juice. 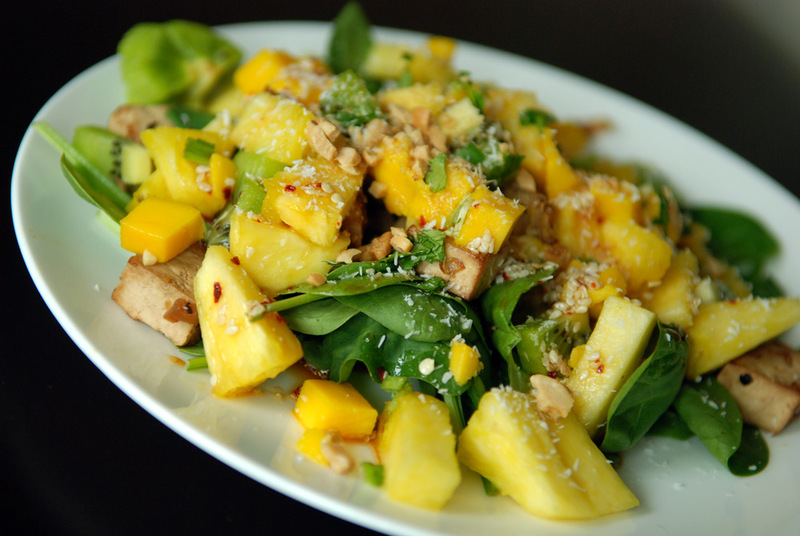 This week, I hope to highlights different ways of including tropical fruit into your meals. 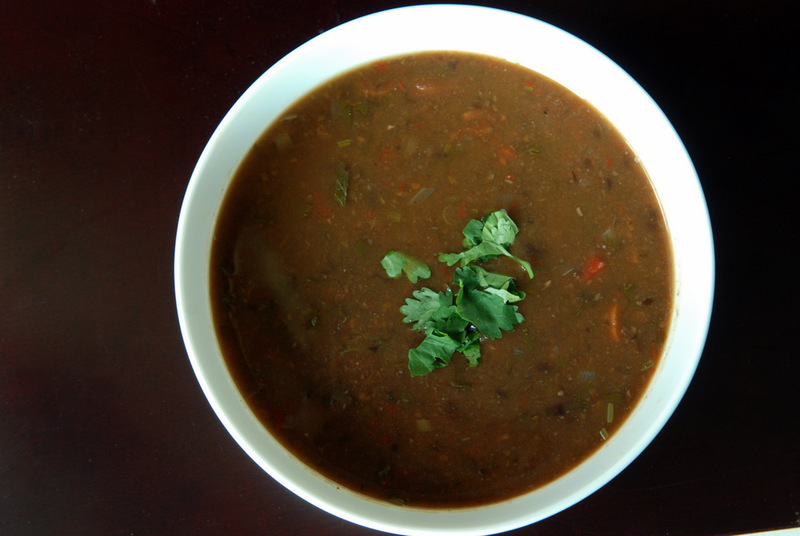 This is my submission to Deb for this week’s Souper Sundays, to this month’s My Legume Love Affair, hosted by Jaya at Desi Soccer Mom, E.A.T. World for Brazil and this month’s No Croutons Required featuring legumes (since I was born in June). I can do mad damage if I am in the right store. Not a clothing store, not an electronic store, not even a bicycle store…. Food-related? Yuppers! Sometimes it isn’t as bad for local stores, since I tell myself I can always go back next week. That’s my inner monologue trying to talk some sense into me. Sometimes it works. Other times not. Last week, I went to T&T. I hadn’t been in a while, since it isn’t close by and I am not (currently) biking (snow! grr!). Watercress, 2 bunches for 88 cents. That was the plan. Maybe some mushrooms. I came back with watercress, shiitake mushrooms, enoki mushrooms (love them! on sale! ), snow peas (love them! ), soy milk (new kind to try! ), mango nectar (I have plans!) and a new, mystery ingredient: pea shoots or dou miao (unlike Chinatown, T&T actually labels its produce, hehe). They were so fresh, and even though I had never heard of them, I figured a new green in my life couldn’t hurt. 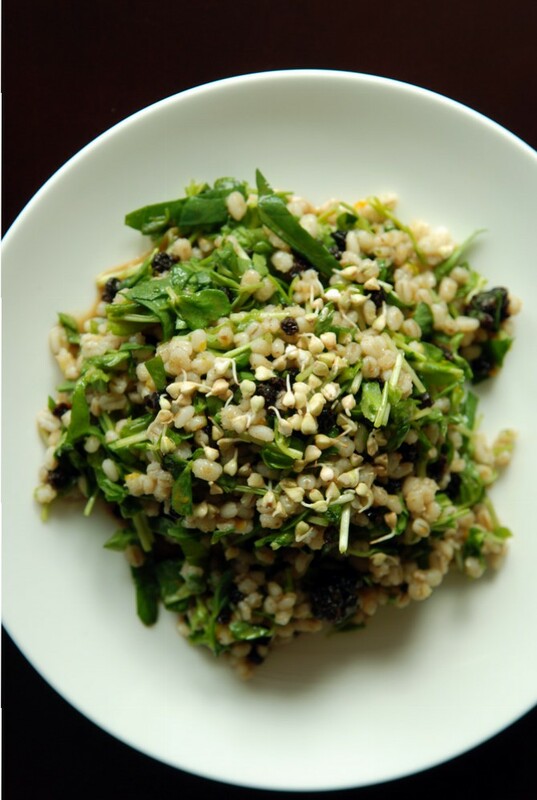 I tossed the pea shoots into this Moroccan Barley Salad, inspired from the Moroccan Barley-Spinach Toss in Radiant Health, Inner Wealth (Tess has posted a version with quinoa here). 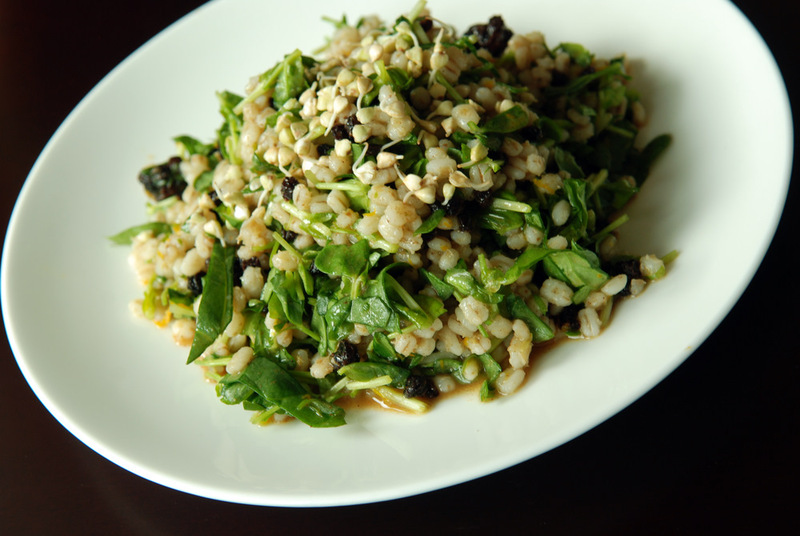 In my version, barley is toasted, then cooked and mixed with a light, fresh dressing made of fresh orange and lime juices, cinnamon, cumin and green onions. 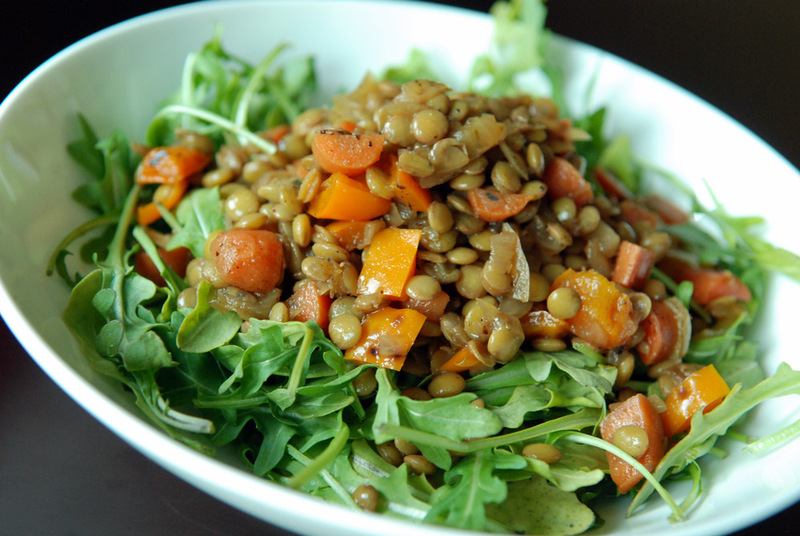 I also topped it with sprouted buckwheat. 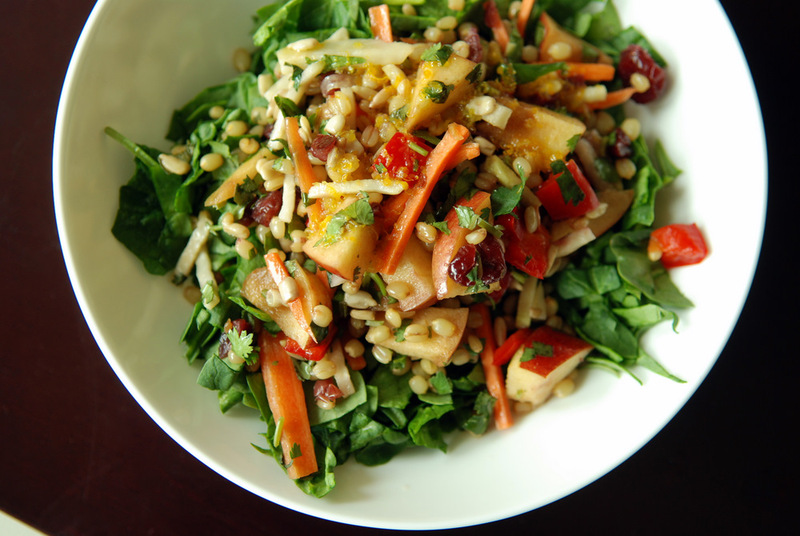 The barley salad is cinnamon-heavy with a lightness brought from the citrus juices. It isn’t that sweet with the agave because I used currants (not raisins). The sweetness comes from your greens. In my case, pea shoots! For leftovers (not photographed, sorry! 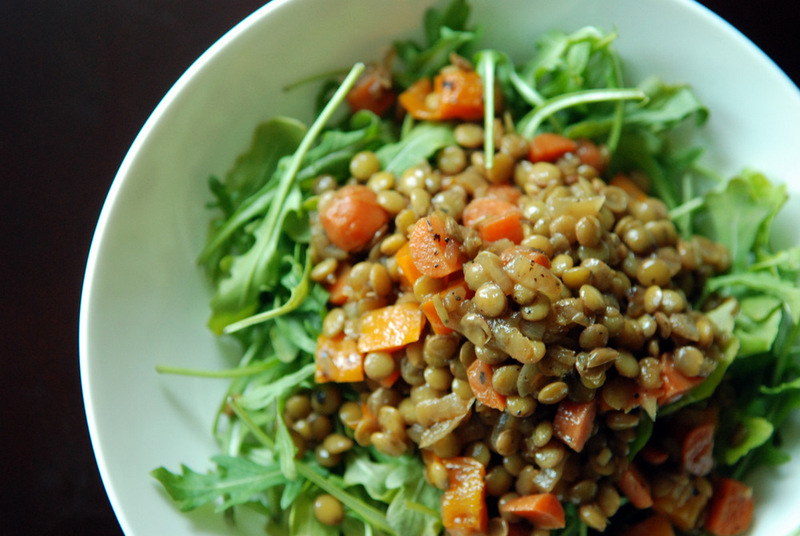 ), I added even more pea shoots, so this was more of a pea shoots and barley salad, and I was in heaven. Pea shoots, as it turns out, are the young leaves from the sprouting pea plant. The early shoots and tendrils can be harvested numerous times (it will eventually become bitter as it ages) until the plant produces peas. While they are uber pricey at places like Toronto Sprouts at the St Lawrence Market (over $4 for 125g), I thought they were reasonably priced at T&T ($11/kg or $2 for a large container). However, it would be even cheaper to grow your own (I hope! In my garden to be!) and I picked up some dried green peas from Rube’s Rice ($0.95/lb) to see if I could grow them at home (I am really encouraged by Shauna’s post!). In short, scour your Asian grocery stores for this delicacy! Or grow it yourself! This is being submitted to this week’s Weekend Herb Blogging, hosted by Susan from The Well-Seasoned Cook.